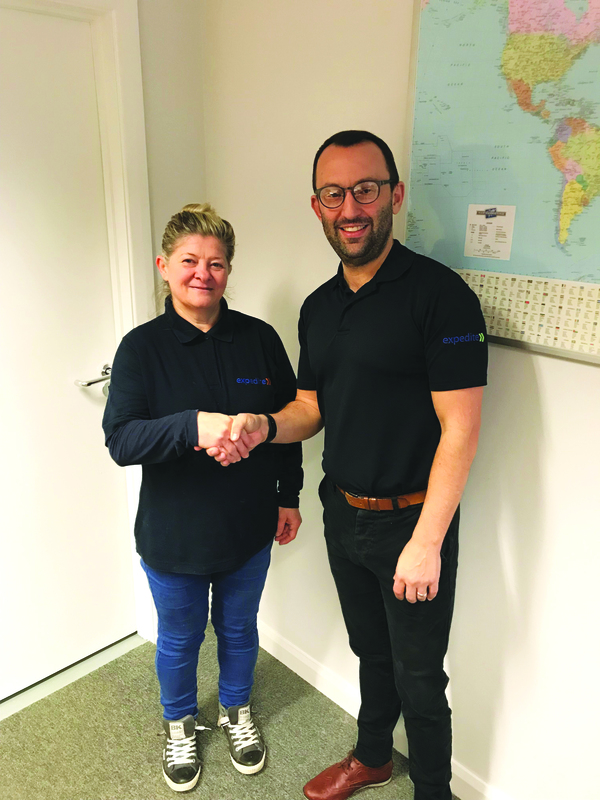 Pattersons Cleaning Supplies Announce The Pattersons Cleaning Of The Year 2018 winners awards in Bristol and Weston-Super-Mere! Last year, a heart warming story about students at Bristol University raising a fantastic £1,500 for their cleaner and his wife to jet off on a holiday to Jamaica to visit their families filled our hearts with love earlier in the year. The grateful students wanted to thank Hermon, their rather surprised and overwhelmed library cleaner for his “positive energy” and for brightening their days, whilst of course continually keeping their library a clean and positive place to work and learn. With that in mind, we were inspired to launch our first ever Pattersons’ Cleaning Of The Year competition as an opportunity for people to nominate cleaners they know for their hard work whether that be being a particular hard working, positive and an all-round great employee, a cleaner who has gone above and beyond in their daily tasks or someone who is just in general a team player! Whatever the reason, we wanted to give you the opportunity to recognise and thank a great cleaner you know by nominating them for our Pattersons’ Cleaner Of The Year award! Well, the response we received was amazing and went far beyond our expectations! As our first Pattersons’ Cleaner Of The Year competition, we weren’t sure how much interest it would gain, but from the very day we launched, it was extremely clear that you all have lots of fantastic cleaners you wanted to thank and we only wish we could recognise all of them for their hard work! It was inspiring and heart warming to receive so many amazing nominations, but obviously this meant it was a difficult task for us to choose a winner! The winner of our Pattersons Cleaner Of The Year Award 2018 is Ari Judit Roza from Expedite Commercial Cleaning. Judit who covers a number of Expedite’s sites impressed us with her consistent hard work and dedication to the job. “Within all the sites that she is looking after I have not once received any negative feedback from our customers, anything is never too much for Judit. Customers have pointed out that, without fail, every shift that Judit does she will always ask the client if there is anything else that she can do for them. To top it all off Judit is a lovely person who goes about her daily job with a smile, a great employee!” beams proud manager, Wayne Potter, Director of Expedite Commercial Cleaning. 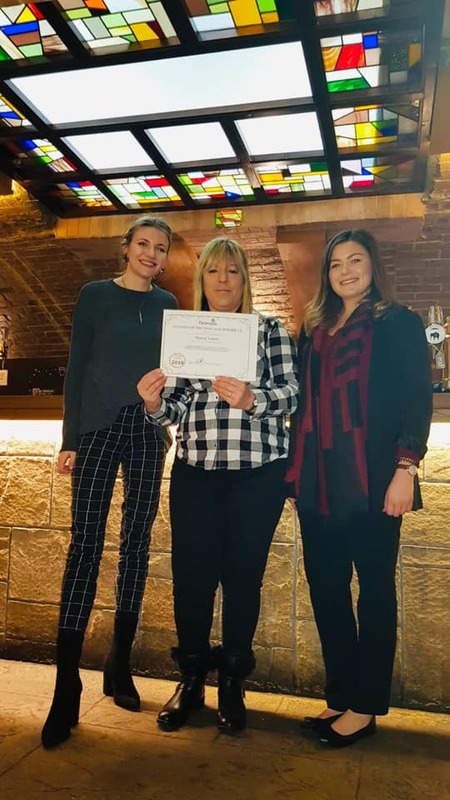 Here you can see our fantastic winner Judit with our very own Chloe and her award as well as Judit and her very proud manager, Wayne Potter, Director of Expedite Commercial Cleaning. As the nominations we so fantastic, we decided it was only right that we would also award a 2nd place runner up prize and award to another stand out nomination. This award goes to Stacey at The Beer Emporium who impressed us with her cleaning results. “Stacey has over time produced a premises where we can physically see the improvements all around the place from the toilets, to the trading areas to the doors and the stairwells. She has removed chewing gum from seats and tables even under our bar. She is a hugely important part of our team at The Beer Emporium and we count ourselves very lucky that she is an integral part of our small team. 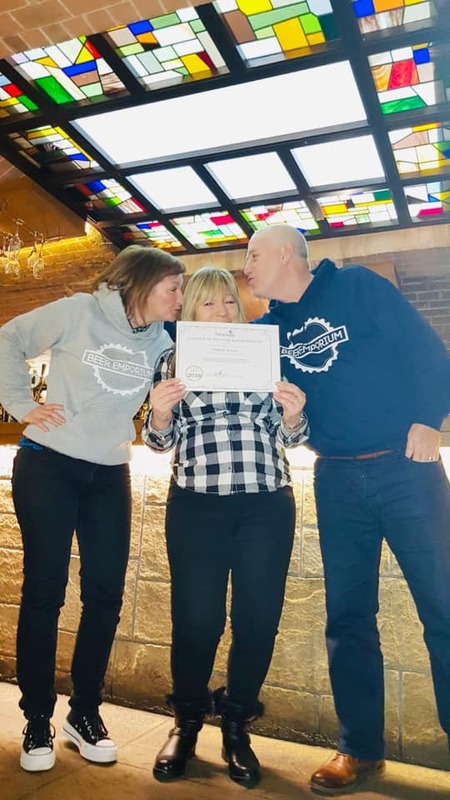 Stacey is a credit to herself and her profession and in my mind having seen what the mediocrity that has preceded her, I have, hands down 100% belief that she truly Is the Cleaner of the Year hands down” beams Stacey’s manager, Steven Black, Director of Bristol Beer Emporium. 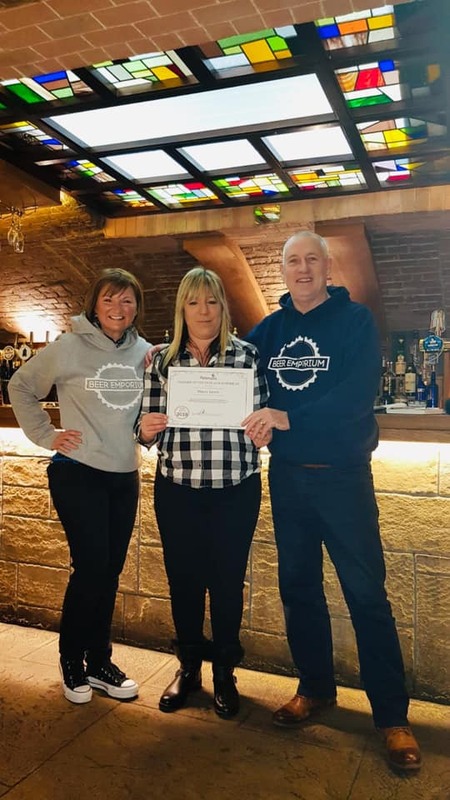 Here you can see our very own Chloe and Natalie presenting Stacey with her certificate followed by Stacey and her proud managers and the team behind the fantastic Beer Emporium. Can we also take a moment to appreciate the stunning mosaque on the ceiling in the bar! A massive congratulations to both our Pattersons’ Cleaning Of The Year 2018 winners and we would also like to extend a congratulations to everyone who was nominated. You are all fantastic!